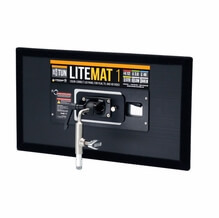 Ground breaking lighting from LiteGear, the LiteMat will change the way you think. Simple to use, lightweight, durable and affordable are the features we all desire in a light source. At just one inch thick and surprisingly bright, the LiteMat will be in everyone's arsenal. Available in 5 Sizes. Do you already own LiteGear? That's great, because all your dimmers and power supplies, cables and battery adapters, that you use with VHO Pro LiteRibbon, work with it. A complete interchangeable system for all your lighting needs.